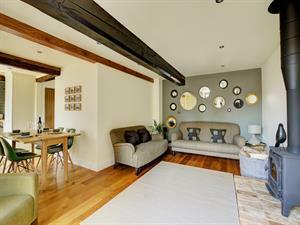 1 Manor Barns01263 715779work01603 870304fax Self-cateringRelax within the cosiness and character of this new barn conversion which is conveniently located only a few miles from the beautiful North Norfolk coast. This dog friendly, open-plan living accommodation is well equipped and provides that 'home from home' feeling - perfect for unwinding and getting away from it all. The pretty town of Holt is only a short distance away and offers a great range of shops and places to eat, or why not visit the coast, Blakeney, Morston and Cley-next-the-Sea are all perfect spots to soak up the stunning Norfolk coastline and are home to many great areas for birdwatching and enjoying a breath of fresh air in vast open marshland. If you love wildlife do take a boat out from Morston or Blakeney to Blakeney Point to see seals in the wild; there is so much to do and 1 Manor Barns is a great base to return to at the end of a days' exploring! Attractive Sitting Room with plenty of comfortable seating, Smart TV, iPod dock, Blu-ray player, DVD player, WiFi, dining table and chairs. Relax within the cosiness and character of this new barn conversion which is conveniently located only a few miles from the beautiful North Norfolk coast. This dog friendly, open-plan living accommodation is well equipped and provides that 'home from home' feeling - perfect for unwinding and getting away from it all. The pretty town of Holt is only a short distance away and offers a great range of shops and places to eat, or why not visit the coast, Blakeney, Morston and Cley-next-the-Sea are all perfect spots to soak up the stunning Norfolk coastline and are home to many great areas for birdwatching and enjoying a breath of fresh air in vast open marshland. If you love wildlife do take a boat out from Morston or Blakeney to Blakeney Point to see seals in the wild; there is so much to do and 1 Manor Barns is a great base to return to at the end of a days' exploring!